Commissioned by the Mental Health Commission of Canada (MHCC) and prepared by a research team from the Children’s Hospital of Eastern Ontario, this comprehensive report — Taking the Next Step Forward: Building a Responsive Mental Health and Addictions System for Emerging Adults — details the current state of policies and practices for youth transitioning from child and youth to adult mental health and addiction services. We released an executive summary of this document in February. This report gives advice on how to address the issues youth living with mental health problems and illnesses encounter when transitioning to adulthood. Taking the Next Step Forward offers recommendations for advancing better services for emerging adults at the national, provincial/territorial, and regional levels. 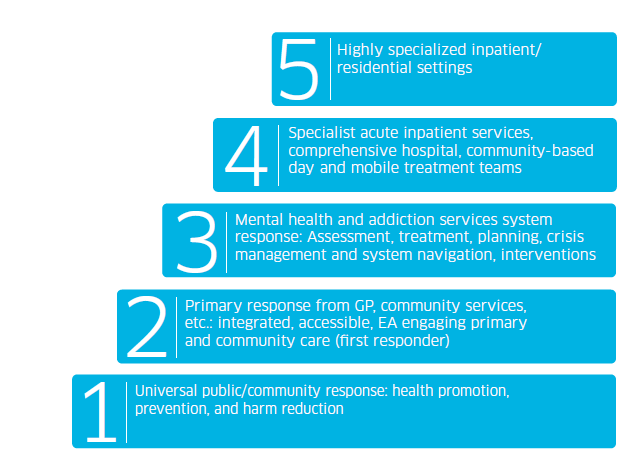 In order to prevent harm, address needs, and ensure access to services at the required level of intensity and specialization, the ultimate goal is to have a full continuum of services available to emerging adults in every jurisdiction (see Figure 1 below). Taking the Next Step Forward is just one of a number of ways the MHCC supports child and youth mental health. Download an overview here. We also encourage you to share this document with your networks. Currently, the term “emerging adult” is used to describe youth and young adults (ages 16-25). The term highlights the significance of the growth and development during this part of the lifespan. Using the term “emerging” also acknowledges this phase as a dynamic process, rather than a prescribed span of time driven by chronological age.